Gregory Durkin is a transactional attorney representing clients in a wide range of complex business transactions, with an emphasis on representing physician practices, pharmaceutical companies, hospitals, health care technology companies and other health care industry clients in mergers and acquisitions, equity financings, joint ventures and general corporate matters. 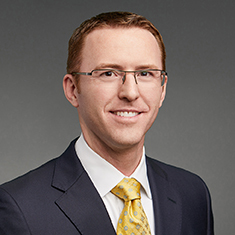 In addition to his work representing health care industry clients, Greg regularly advises middle market private equity funds and their portfolio companies in financings, acquisitions, dispositions, non-control investments and restructurings in a variety of industries. While in law school, Greg was an editor of the Washington and Lee Law Review. Shown below is a selection of Gregory’s engagements.